Aspyr Media is currently working on the feasibility of porting Civ VI to Linux. They are the same great company that gave us the Linux port for Civ V.
Note: This is also discussed in this Steam group. 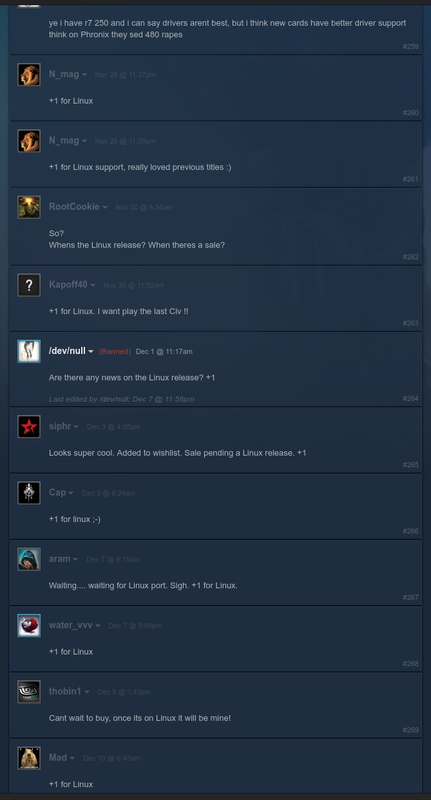 The Steam topic in question is about Linux support, wherein we, the Linux community have been expressing interest and support of the possibly upcoming Linux release by Aspyr. We've also been talking about technical challenges, APIs, as well as things we'd like to see in a port. Aside from the trolling from the usual people like meraco, it's been positive and encouraging. The moderators are NOT employees of Aspyr, Firaxis or 2K Games. They are "volunteer" moderators who don't seem to have any responsibility to any of the involved companies. The moderators do not seem to have any direct connection or communication with Aspyr/Firaxis/2K Games, they get all their updates from Twitter and other social media just like the rest of us. NOTE: This thread has been heavily edited. Many of the supporting posts have been removed. I preserved a couple screenshots of my post just in case, but I wish I had the whole thing. Maybe some of the other community members can fill in some of the gaps here. 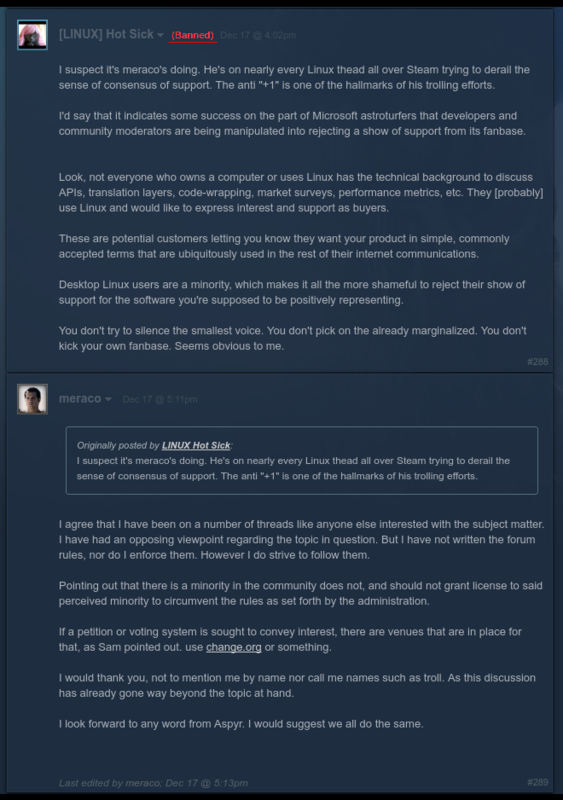 The mods are attacking the Linux community, citing rules violations for expressing support of a Linux port. We begin, not suprisingly, with the user, meraco. Which you've likely heard of before. This time the mods jump on his bandwagon. This ban really bothers me. This is what unacceptable developer/publisher support looks like. Several users, myself included, have been banned. Many posts by many more users have been selectively erased to dismantle the consensus of support. None of the [notably anti-Linux] trolls have been banned, however. Annnnnd throwing it down the memory hole. The 2K forums host civil discussions on a variety of topics, and we always want to keep the conversation welcoming, inclusive, and a positive experience. Should people be arguing with mods in general? No. Probably not. Should mods visibly undermine Linux discussions? No. Probably not. Should people be banned for respectfully staying on-topic? Again, No. Definitely not. Moderation is a responsibility, not a position of power to arbitrarily abuse others for political reasons. If we cannot respectfully discuss these abuses in order to reinstate a positive atmosphere, we are only going to continue to be abused. Quote Thank you so much for bringing this to our attention. The last thing we want is for players to feel ostracized. I have forwarded this email to those who monitor our forums and we will be discussing what to do shortly. Again, thank you so much for your concern for this community. We really do appreciate it! Thanks again to Aspyr for being Linux champions. As of writing this we've yet to receive a response from Firaxis or 2K Games. Showing support for Linux games is great, but people like "meraco" should be completely ignored. Do not rise to their apparent trolling by quoting them or replying to them. They and other anti-Linux posters feed on your replies. Just don't rise to them, you make it worse by doing so. The moderators likely would have ignored it if people didn't rise to the trolls. 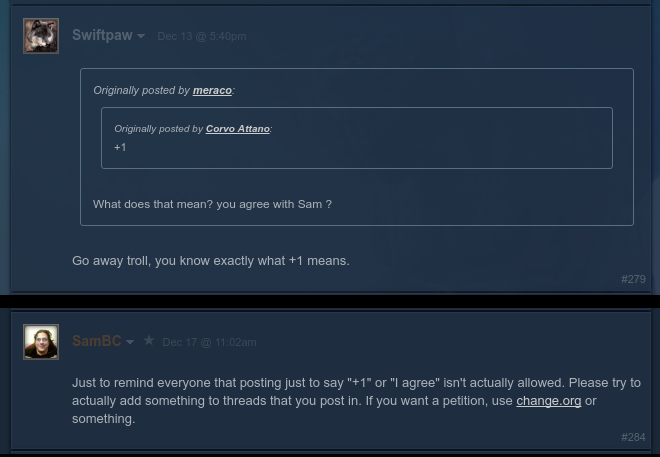 As for posting "+1", that alone is spam (by Steam's standards) so be sure to reply with more than that. It's also never a good idea to discuss a moderators actions in public on Steam, as that will obviously have repercussions. Same goes for claiming it's some sort of dictatorship. That goes for any website, not just Steam. 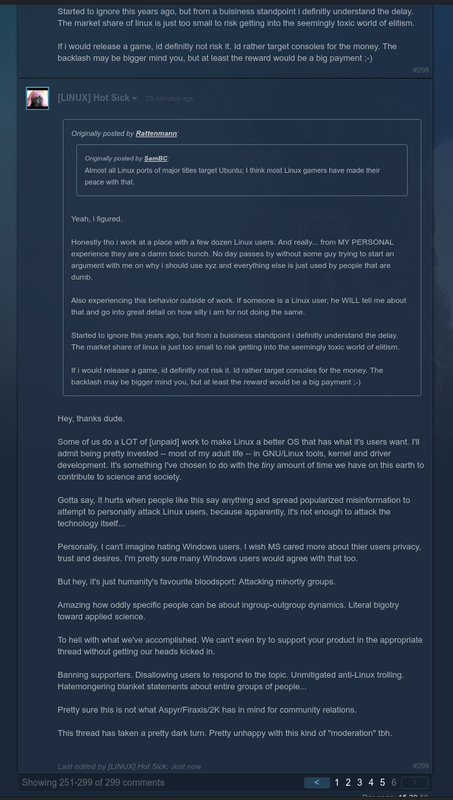 As always, if you want to show support for a Linux port be smart about it. Feel free to use our forum at any time and link developers to it. I won't go around locking them. Quote Showing support for Linux games is great, but people like "meraco" should be completely ignored. Do not rise to their apparent trolling by quoting them or replying to them. They and other anti-Linux posters feed on your replies. Just don't rise to them, you make it worse by doing so. The moderators likely would have ignored it if people didn't rise to the trolls. That's indeed the only thing which is working. If you try to argue with people like "meraco" you will never win the discussion. Ignoring works best. If you want to know how totalitarian society looks like, look at highly moderated place on internet. Colombo If you want to know how totalitarian society looks like, look at highly moderated place on internet. If you want to know how anarchy, ridden by the loudest (and most stupid), looks like, look at an unmoderated place on internet. I don't know aout this case, but there has been such a thread where Meraco ignited a discussion which resulted in the thread being closed. His poison does work sometimes. Poor him if that gives him any satisfaction. I just don't understand why Windows users have this urge to bombard us on forums... What pleasure does it give them, if Windows is so great then use it and be quiet and ignore linux posts, everybody has the right to like different things depending on the taste. 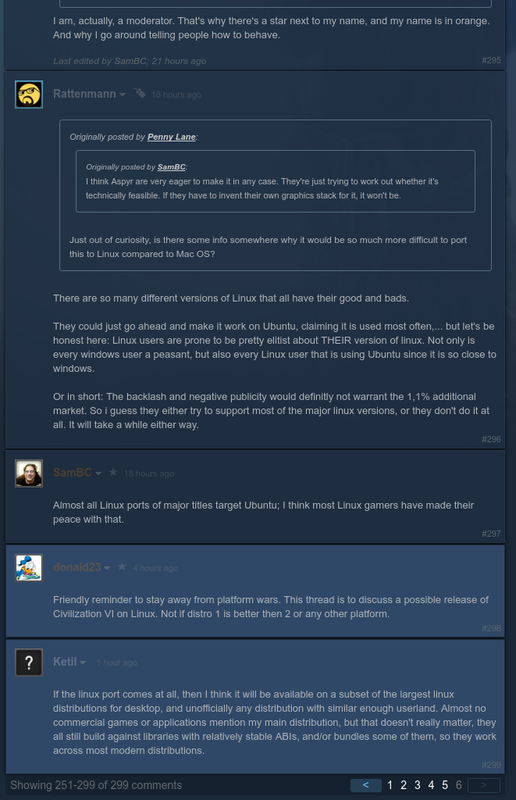 It's like they're allergic to such threads where our community asks for linux ports. However it's useless to even try and start a debate with people that don't want it in the first place. I don't understand the fanboyism about the things that I pay for, if I buy a game I'm not its' fanboy, I expect it to work. If I buy Windows I have no reason to be a fanboy just want it to do what it's meant to do. However linux is different, it is a philosophy before the OS and made for community by community and majority of people don't understand the benefits that Linux is actually giving them at this very moment (iOS vs Android). I don't mind anyone using Windows if he needs to, I also doesn't mind using Windows if I really needed to but this hate coming from those kids on Steam acting all smart are just useless. I'd totally understand it if we would be capturing every thread, but man, one thread per game, just how unbearable can this be? MaCroX95 I just don't understand why Windows users have this urge to bombard us on forums... What pleasure does it give them, if Windows is so great then use it and be quiet and ignore linux posts, everybody has the right to like different things depending on the taste. It's like they're allergic to such threads where our community asks for linux ports. However it's useless to even try and start a debate with people that don't want it in the first place. I don't understand the fanboyism about the things that I pay for, if I buy a game I'm not its' fanboy, I expect it to work. If I buy Windows I have no reason to be a fanboy just want it to do what it's meant to do. However linux is different, it is a philosophy before the OS and made for community by community and majority of people don't understand the benefits that Linux is actually giving them at this very moment (iOS vs Android). I don't undertand it too. Thats why I stay away from such forums posts. That quote was the quote I was looking for and it summarize it perfectly how to deal with trolls.